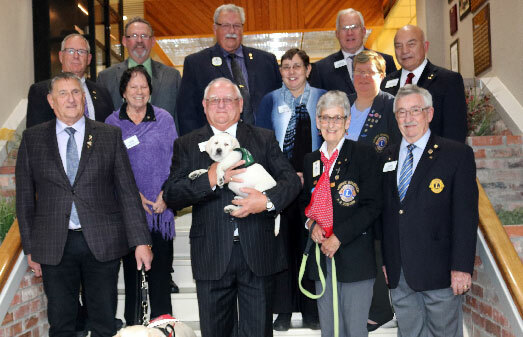 The Board of Directors is instrumental in successfully leading Lions Foundation in its efforts to provide Dog Guides at no cost to Canadians with disabilities. Each member sits on the board for a three year term, with the exception of the Chairperson, who is voted in annually. Do you believe in Magic? The unfathomable inherent skills of specially trained Dog Guides and the skills of the LFC Dog Guide staff do provide a sense of magic and a new feeling of independence for hundreds of Canadians with a disability. We can believe in the Magic! "The freedom a Dog Guide provides is another word for independence, hope and a sense of a normal life. I hope as the Chairperson of the Board, I can help spread the word about the incredible work of Lions Foundation of Canada." Dave (a Lion since 1974) first became aware of LFC from his father who was a District Governor in 1984 and he became a director for LFC in 1986. Dave reconnected with them after settling in Winnipeg and started to attend the Pet Valu Walk for Dog Guides. He then ran for District Governor in 2010 and knew that LFC was to be one of his charities of choice. The DGE visit in June 2012 put it all into perspective for him as he witnessed how the foundation changed individuals’ life for the better. As a director he will continue to increase awareness in the area for this very worthwhile program. "The best way to find yourself is to lose yourself in the service of others, I hope to help our area further the program for Dog Guides." This is David Manning’s second term on the Board of Directors. His first involvement with LFC began in the 1990’s when he was inspired after hearing a Canine Vision client speak of his experience with a Dog Guide. He has since been the Nova Scotia Director from 2004-07 and Chairperson following. He assists in organizing Pet Valu Walk for Dog Guides events. His motivation is strong and he has a great deal of knowledge about the foundation. "Dog Guides that are trained at the Lions Foundation of Canada can make such a great difference in a person’s life. As a Lion, I believe that supporting the programs at LFC ensures that we can continue the process of changing lives." Maureen is a second year director, who is a dedicated and passionate supporter of the Lions Foundation of Canada Dog Guide program. Her passions run deep with the Project Pride Program, in which she travels around the schools in her district spreading the word to children regarding the wonderful programs and on how lives are changed by Dog Guides. "Dogs may not be our whole life, but dogs can make our life whole"
Mel Foat is not only a board member but is legally blind and a first time CVC Dog Guide handler. Besides his position as Director for Alberta and NWT, he is also Deputy Mayor of his home town of Chestermere, Alberta. Mel is a retired farmer, following his loss of sight 5 years ago. He loves to tell children and adults about the benefits of a Dog Guide. "I cannot even imagine my life without my Dog Guide Walker, the great Golden Lab"
Andre is a longtime supporter of the Lions Foundation and has served the organization in many ways. As the Past Chairperson, Andre is working to promote and secure funds for the seven Dog Guide programs. "Dog Guides are important because they provide safety, independence and freedom to their recipients"
Joanne has been a Lion for 14 years and the District Rep for Lions Foundation of Canada for three years. While working at a restaurant, Joanne met a gentleman with a Seizure Response Dog Guide, and his story helped Joanne make the connection with Dog Guides and being a Lion. While attending DGE orientation, she met many recipients of Dog Guides and heard their heartfelt stories. All these stories tugged at Joanne’s' heart and she knew, at that very moment that she wanted to help raise awareness for the Lions Foundation of Canada. "Dog Guides gives you a better quality of life by living your life to the fullest"
Sam is the current President of the Parkdale Sherwood Lions club, the founder of the PEI Ride for Dog Guides and he also has a personal connection to the foundation as his wife Jennifer is visually impaired and is a client of the foundation. Seeing how much each Dog Guide has helped his wife gave him the drive to help others become aware of all the great things that are happening at the LFC and the opportunities for clients to gain strength, courage, mobility and independence. "Life is made up of chances and opportunities, its our responsibility to help provide as many chances and opportunities to those that need a hand to do so.."
Brennan Beaumont is a first year director for New Brunswick and a Lion since 1979. Since joining, he has been a strong supporter and remembers the feeling after seeing the first Canine Vision Dog Guides in 1985 and how grateful all the recipients were of our success. Now living in NB, Brennan still chooses the foundation first, whenever possible. From Club President to Governor to Director, he’s busy organizing and promoting LFC throughout the district, and raising much needed funds for the foundation. Janet Marissen joined the Lions Foundation of Canada in 1995. A dog lover all her life, Janet and her husband, PCC Harry became foster puppy raisers in 2000. Her involvement in the Foster program gave her the opportunity to interact with other foster families, meet graduates from LFC, and educate the public about Dog Guides. Janet is involved in many aspects of Lions including being a National Trainer for Lions Quest and a facilitator of Lions Clubs International Institutes. "Having a small part in providing Dog Guides is one of my greatest joys. Knowing the difference that dog is going to make in the life of its "forever person" makes everything I do for the Lions Foundation worthwhile." Richard became involved with Lions Foundation after a fellow member of his Lions club received a Dog Guide. Attending the graduation ceremony convinced him that he could help others by raising awareness of Lions Foundation’s programs, promoting the organization’s mission in his home province of Quebec. Together with his club, he is dedicated to working on community efforts fighting blindness, promoting active living, as well as Dog Guides’ programs. "Attending a graduation ceremony showed me that I could be helping more people receive a Dog Guide by actively promoting our school. I’m very proud to serve as a Lion for the Foundation." Penny joined the lions club of Corner Brook as a promise she made to her aunt Jackie Spencer back in 2003 before she passed away. Since becoming a lion, Penny has chaired many projects and has held many offices. Penny received Rookie of the Year in 2003-2004 from district 41-s1, has also received 14 International Presidents Certificates of Appreciation. "A Dog is the only thing on earth that loves you more then he loves himself."